Simply Colorful by V and Co for Moda is the ideal range if you love vibrant colour and bold patterns! In bright yellow, deep orange and warm red, the range has fun geometrics and softer florals in each of the three colours, working well with plains or great for making a statement on their own. Great to build your stash, or for when you need lots of different prints in a certain colour range. 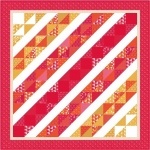 Please click on a Moda Simply Colorful patchwork fabric for more details.